That blouse is hot! Love your necklace. Starting the week of right sister! I'm in black and white too today. you find the best pieces at zara, love those shoes! Absolutely love it! Esp. love all the bracelets together with the watch. Zara has so many great pieces this year and this blouse is one of my favorites! Very cute blouse and with these shoes it looks great! You always look so stunning. I love the background scene as well. Such a stunning and sophisticated look. I own the same shoes, love how you styled them! LOVE IT!!!!! The blouse and the shoes are TDF!!! i love a good winter white. do you curl your hair every morning? i would love to see it straight. Really love the metallic shoe trend. I'm having a hard time finding a reasonably priced/cute pair. LOVE this casual but totally chic look! i DIE for your shoe collection. The blouse print is beautiful but I really love your shoes!! Geez those pumps are to die for! Love the print of that shirt! love your blouse and those pumps! That is one friggin' fantastic blouse. Love the Zara top! Wish I could walk in those beautiful shoes! Fabulous, love the whole look! so chic. Love the blouse, of course. 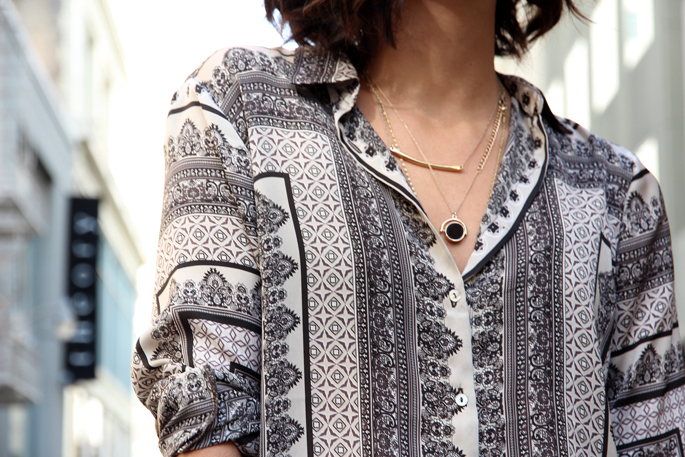 Adore that scarf-print blouse and this all black & white look! So fab! And I am obsessed with those shoes- I almost got the gold ones but they didn't have my size- UGH! Adore this and the side part in your hair! Looking gorgeous, lady! Black and white are always perfect and love the metallic silver on the shoes. Love the top and shoes! What great pieces. I so regret not buying those shoes.! love the black and gold necklace! This outfit is really making me look forward to spring. It's so chic! Can you re-post the link to the pattern blouse? The hyperlink now goes to yesterday's post. You make that print look so fresh and modern, Krystal! And your shoes... those are seriously amazing. Stunning shirt, such a beautiful print! I LOVE your hair! Yet another stunning outfit! You look fantastic! I never thought silver shoes were particularly attractive... you have REALLY turned my mind around! Very chic. I absolutely love this outfit. Thanks for inspiring. I love the necklaces!! I can't believe they're H&M. I'm going to have to head down to the one near me and look around. You are just the cutest. Obsessed with this entire outfit. I really love your shirt! Great outfit! How stunning is that blouse on you! Love the print on the shirt. Cool jewelry too. Que maravilla !! me encanta todo !! 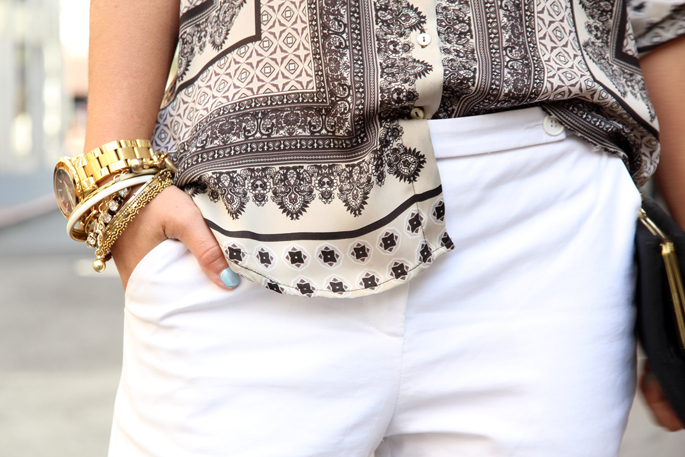 Love that print top with the white pants! Gorgeous and classy! Love how the silver heels really modernize the outfit! Love the top!!! So chic! Krystal - I love that watch! I've stood in that exact spot. lol I guess that seems funny to me since I live in Kansas City.